For the first time ever, I play live pool on camera. This was recorded around a week and a half ago and is a race to 9 vs my good friend Mal which he won 9-8 giving me a 6 rack head start. 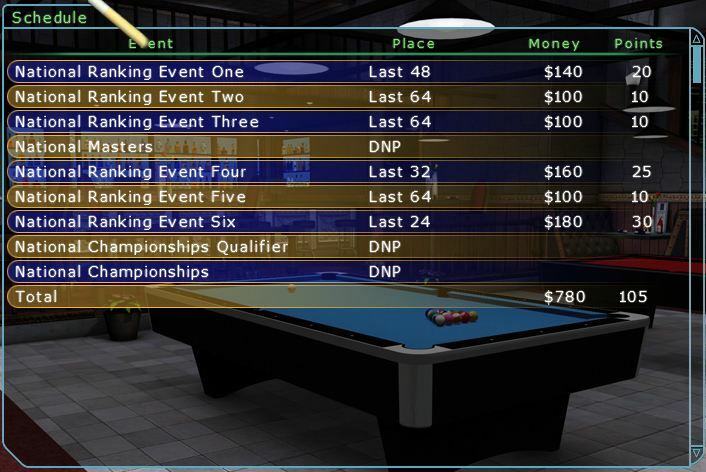 Mal is an excellent pool player in both real life and on VP4 and runs his own pool blog over at runout.tv. I find video to be a great practice tool as quite often what you feel you are doing is nothing like what you are actually doing. This video has taught me two things, I’m not as bad as I thought (once I got used to playing on camera and got my eye in), and, that I have a little bit of head movement – up and down as I cue backwards and forwards – which I need to quieten down. 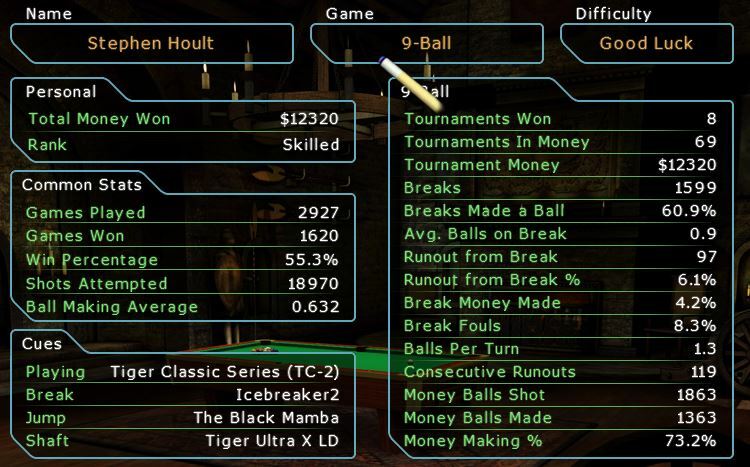 This entry was posted in Pool, Sports and tagged 9 ball, American Pool, Pool on June 19, 2013 by Stephen Hoult. I finished in 60th place, with two last 48 finishes, the rest were last 64s… Only needed 5 more ranking points to beat the drop. I’m actually quite looking forward to as season on the easier Regional Tour. 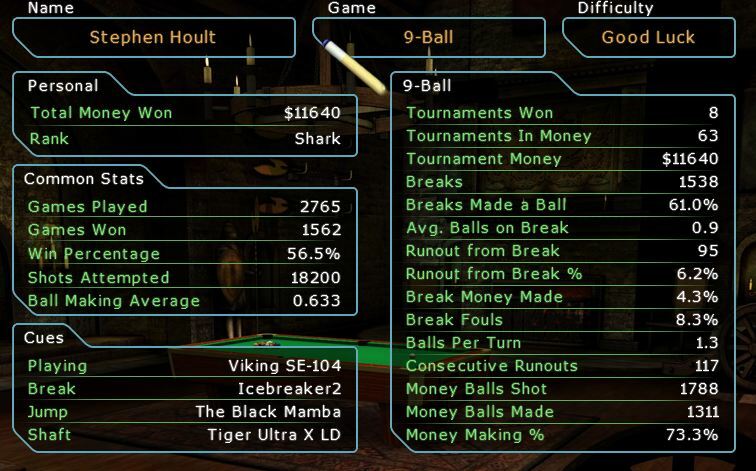 This entry was posted in Pool and tagged 9 ball, American Pool, Pool, Virtual Pool 4 on June 9, 2013 by Stephen Hoult. Once again I managed to retain my place on the National Tour, and once again I feel as if I played terribly. Lets have a look at how my stats compare to the end of last season. Overall, improvement, especially in key areas and no drop in any stats. So I should be happy with that. But it felt like I couldn’t string 3 pots together all season! 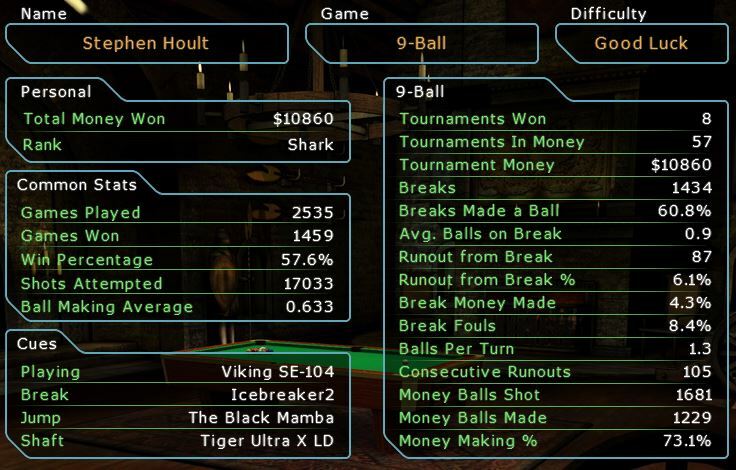 This entry was posted in Pool and tagged 9 ball, American Pool, Pool, Virtual Pool 4 on June 8, 2013 by Stephen Hoult. 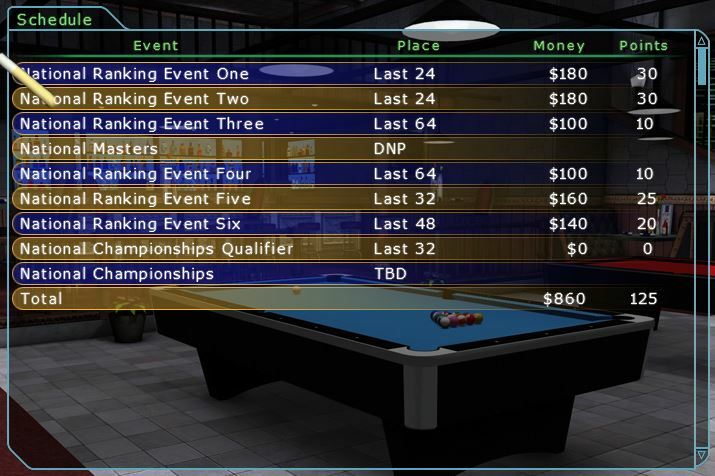 Well, I managed to retain my place on the National Tour for the first time with a 42nd place finish, it doesn’t sound great, but it’s a step in the right direction and all of my stats are improving – especially money making % and run out from break %. Nothing got worse, so things are looking up! This entry was posted in Pool and tagged 9 ball, American Pool, Pool, Virtual Pool 4 on June 1, 2013 by Stephen Hoult.